Entries will be taken from 10 am involving BMX bikes, scooters and skateboards. Entry to competitors is free so come and show the judges your best moves. Spectators can see the spectacular action and cheer on the kids. 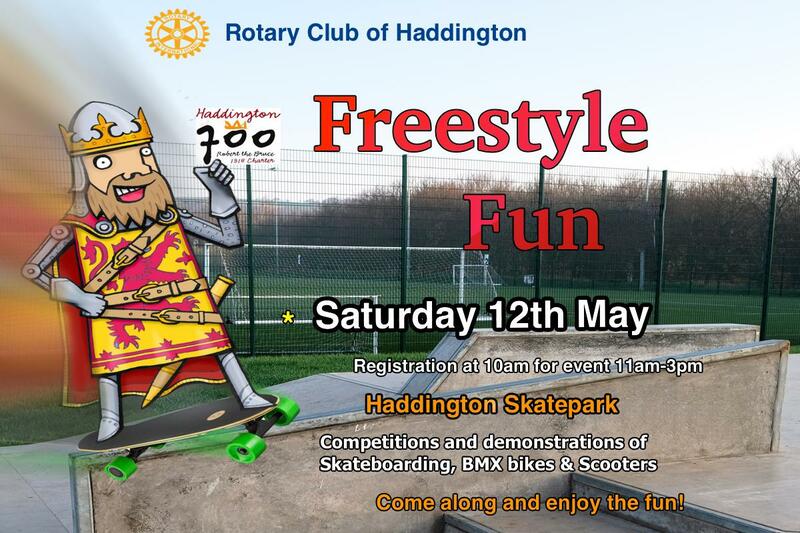 Freestyle Fun comes to Haddington Skate Park on 12th May 2018. Rotary Club of Haddington in conjunction with Skateboard Scotland are running this event as part of the Haddington 700 series of events in 2018 celebrating the granting of the town charter in 1318 by Robert the Bruce. Saturday 12th May entries will be taken from 10 am involving BMX bikes, scooters and skateboards. Entry to competitors is free so come and show the judges your best moves. Spectators can see the spectacular action and cheer on the kids. Entry forms can be downloaded here and please note that any competitor who is under 18 on 12th May must have the approval of parent or guardian to enter. Prizes will be awarded for each division and age group with vouchers and cash prizes from our sponsors. Competition will take place from 11am with the heat draw being organised on the day depending on competitor numbers. Each competitor will be given a wristband with their competitor number and the heat draws will be posted on the Skateboard Scotland notice board. Competitors should be ready for their heats at least 5 minutes before the heat time. · Tricks: -Well executed, clearly identifiable, landed, number of tricks. · Difficulty: -Level of difficulty of tricks, variety. · Originality & flow: - Has the competitor used all areas of the skate park? Do the tricks/line flow well together? Judges will take account of the age of competitors when deciding the points awarded. During the competition only the performing competitors are allowed on the skate park. Please note that the skatepark can be potentially dangerous and you compete at your own risk. Also, competitors will not hold The Rotary Club of Haddington or Skateboard Scotland liable in any way whatsoever for any injuries while participating in or spectating at this competition. It is strongly suggested that you use safety equipment such as a helmet while competing. If you don’t own a helmet, consider borrowing one from a friend. You should also be aware that photographs and/or video will be taken at the event by spectators and friends. Refreshments and toilets are available at the nearby pavilion for the all-weather football pitches. Should there be continuous heavy rain on the 12th May the event will be put back to the 13th May as for safety reasons the skate park has to be dry. Please keep an eye on our Facebook page for the latest updates. If you want to find out more about the work of Rotary please check out the rest of our web site.